Google loves to brag about how its self-driving cars have the ability to save lives by being really good at not crashing into things. But crashes do still happen, and when they do, Google apparently has a backup plan: human flypaper. Yesterday, Google was awarded a patent that proposes placing a strong adhesive on the hood of its autonomous cars. This way, pedestrians or cyclists who happen to find themselves being struck by a Googlemobile would be protected from what’s called “secondary impact.” This is the part of a crash when a person is thrown back off the moving vehicle, usually hitting the roof of the car, the hard surface of the street, or another car. It’s also the part that often causes the most serious injuries. While such systems are being developed, it must be acknowledged that, on occasion, collisions between a vehicle and a pedestrian still occur. Such safety mechanisms may become unnecessary as accident-avoidance technology is being further developed, but at present it is desirable to provide vehicles with pedestrian safety mechanisms. 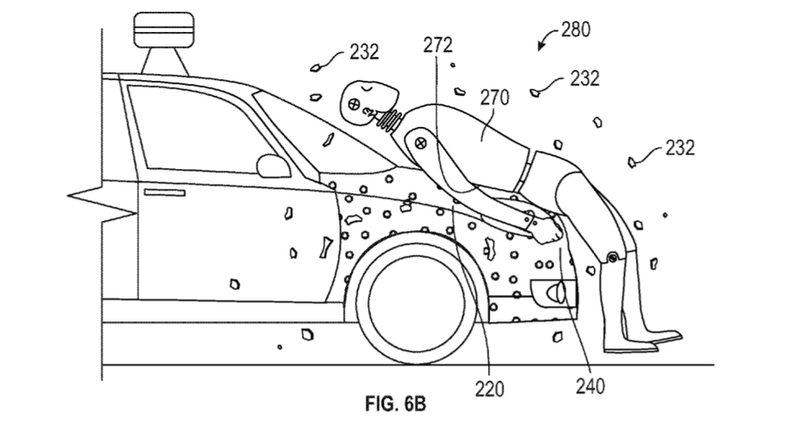 As for what kind of glue Google is planning to smear across its hoods, it’s described in the patent as having some kind of “eggshell”-like coating over the main adhesive layer so the car doesn’t drive around scooping up insects and other small animals like actual flypaper. But would this even work? A single collision with a sticky hood is better from a physics standpoint, according to Rebecca Thompson, head of public outreach for the American Physical Society. But it’s not a flawless idea, said Thompson. With a pedestrian or cyclist stuck to the front of a car, the car might have trouble moving to safety—or it might drag the human’s legs or arms under the car, inflicting new injuries. But she also points out a benefit for regular cars: having a person stuck to the hood might prevent a human driver from fleeing the scene. That would definitely cut down on hit-and-runs. Of course, as a Google rep told the Mercury News, this doesn’t mean we’ll see the human flypaper idea come to life. It’s just another way that shows how Google is thinking about helping its robots to keep more humans alive on our streets.